The NFL players union filed a grievance on Tuesday over the league’s new requirement that players stand for the national anthem or wait in their dressing rooms, a policy that followed President Donald Trump’s denunciation of pregame protests. The National Football League said in May it would require any player who did not wish to stand during the playing of “The Star-Spangled Banner” before games to stay off the field until the ceremony ended. The protests, in which some players took a knee, were intended to call attention to what critics say is often brutal treatment of minorities by US law enforcement. Trump and others have blasted the gesture as a sign of disrespect to the US flag and the military. Before the league announced the new policy, the NFL Players Association (NFLPA) had offered to discuss other ways to defuse tensions over the protests, which were prompted by a series of police killings of unarmed black men in Missouri, New York and other cities. 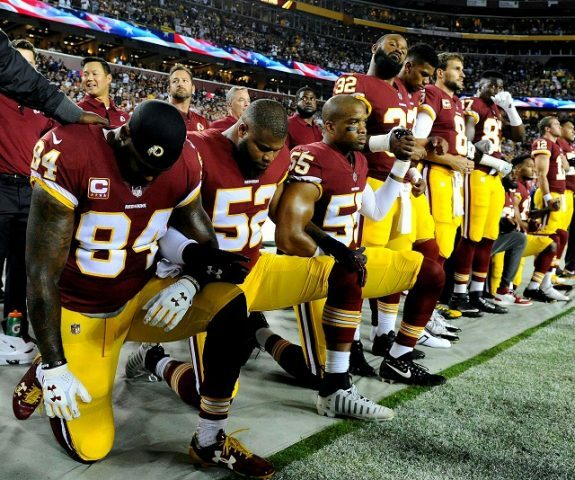 Beginning two seasons ago, a few players have knelt on one knee during the anthem, while others, including coaches and staff, have remained standing with locked arms and bowed heads in a show of solidarity with kneeling players. The protests, and the NFL’s initial acceptance of them, have become a sensitive political issue. During a speech last year, Trump called on NFL owners to fire players who refused to stand. Last week at a rally in Montana, Trump said the NFL’s new policy was no improvement over the league’s previous tolerance. “Just go into the locker room. I think in many respects that’s worse. Isn’t that worse than not standing?” Trump said. Former San Francisco 49ers quarterback Colin Kaepernick started the protests in 2016. Since that season, Kaepernick, 30, has been unsuccessful in getting hired by another NFL team. Last month, Trump withdrew a White House invitation to the NFL champion Philadelphia Eagles after most of the players said they would boycott the event in part because of the president’s stance on the protests. No Eagles players knelt in protest last season.